Canada: The home of maple syrup, free health care and real estate bubbles. 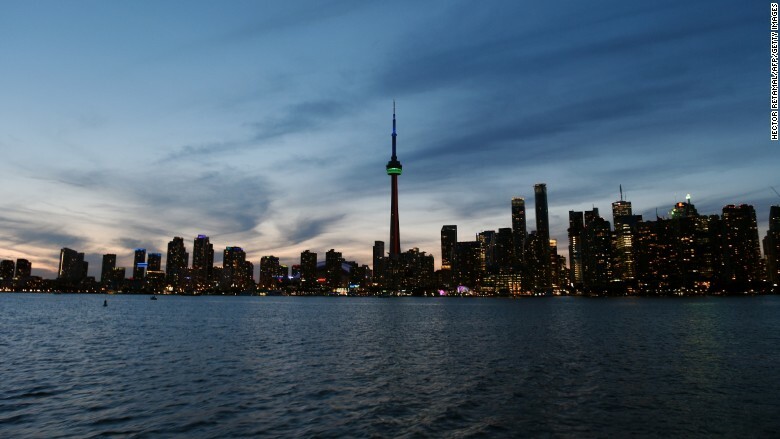 Toronto is the global city with the highest risk of being in a property bubble, outpacing even super expensive New York, London and Hong Kong, according to Swiss bank UBS. It's the first time that Canada's most populous city has topped the annual ranking of 20 major cities. Vancouver, on the west coast of Canada, wasn't far behind. UBS researchers said that prices in Toronto have doubled over the past 13 years, while rents have increased by only 5% over the same period. Home price increases have far outpaced salaries. The bank tracks real estate bubble risk by comparing home prices and income, as well as local rents, construction levels and property prices at the local and national level. The trends apply to Toronto: The key interest rate of Canada's central bank is set at 1%, a few ticks above the 0.5% rate hit during the financial crisis. Canada has also seen a surge of rich immigrants. Some 8,000 millionaires moved to the country last year, according to wealth research firm New World Wealth, with Chinese citizens favoring Vancouver and Europeans heading to Toronto and Montreal. UBS said that two factors could burst the bubble: A strengthening Canadian dollar and more interest rate hikes. A stronger Canadian dollar would make property more expensive for foreigner buyers, while higher interest rates would make mortgages less affordable. Related: How much do parents spend on education? UBS warned that optimistic projections for real estate in big cities can create "ever-greater price fantasies." "Should sentiment change or interest rates increase, a correction is practically inevitable. In the past, rising interest rates almost always triggered a crash in housing markets," the authors said.